Steve Goodkind speaks before the Burlington Telecom Advisory Board. 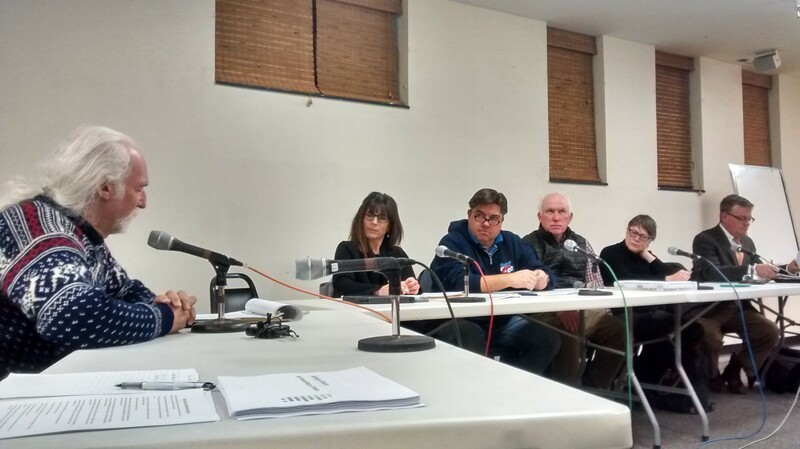 While the city plans to sell Burlington Telecom this summer, residents on Tuesday night said loud and clear that they hope to retain local control of the utility. About 25 people gathered in the Fletcher Free Library, offering the Burlington Telecom Advisory Board words of advice on who the buyer should be and how the city should go about the selling the entity. The half a dozen people who spoke before the board depicted the local fiber-optic network as a valuable public good. “A publicly owned company is a precious commodity and asset,” said Lauren-Glenn Davitian, executive director of CCTV Center for Media & Democracy, Burlington’s public government-access cable station. Losing community control would be “short-sighted,” she added, arguing that the city should maintain a “decision-making stake” in the utility. The sales process may be the final episode in an drawn-out drama involving BT. In 2009, the administration of then-mayor Bob Kiss improperly spent $16.9 million in taxpayer money to save the floundering utility. Citibank sued Burlington for $33 million, and in early 2015, Mayor Miro Weinberger resolved the legal dispute with a $10.5 million settlement agreement. Local financiers, under the company Blue Water Holdings, loaned the city $6 million to cover those costs. As part of its deal with Blue Water, the city must sell BT by January 2, 2018 in order to reap the highest possible proportion of the sale price — 25 percent. After that deadline, the city will receive a decreasing margin of the total price. After a second public forum in February and approval from the Burlington City Council, the BTAB plans to create a list of interested buyers and officially launch the sales process in March. The board has proposed a June 1 application deadline. Finalists would then present publicly before the city council before it selects a buyer by the end of July. Matt Cropp,* a member of Keep BT Local, said the co-op model would “build broad-based community wealth” and urged Burlingtonians to pitch in. He said he was willing to commit a portion of his retirement savings to the cause. Steve Goodkind, who has criticized the arrangement from the start, urged the board to abandon the Blue Water deal. “That’s the devil in this thing. It needs to be gotten rid of,” he said. The board made clear that not selling the utility isn’t in the cards. But they may consider reopening the process if they don’t find the right buyer, said Jane Knodell, a BTAB member who also serves as city council president. BTAB chair David Provost tried to assuage citizen concerns, noting that the board has crafted buyer criteria that emphasize local control. *Correction, February 1, 2017: A previous version of this story misidentified Matt Cropp.